Makes my patio look amazing!! 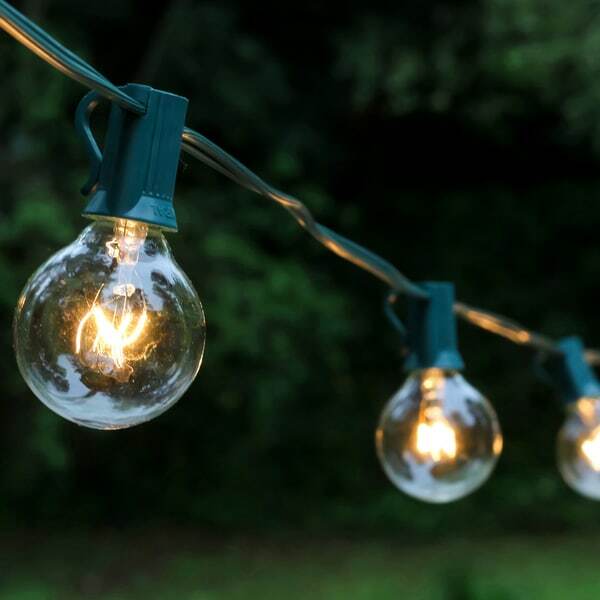 Illuminate your outdoor living area with this 25-light electric light string. This light string features bright clear 7-watt globe lights and end-to-end plugs so you can brighten your entire space and eliminate dark corners. These lights are fantastic because the BULBS are replaceable, not like Christmas light bulbs, I mean bulbs you can buy at any grocery store. This makes them super convenient and long-lasting! They are bright and super for summer nights! great sized bulbs, which put out a lot of light. they look whimsical, which is what i was going for. i have ordered another string of lights to complete patio revamp. would have given 5 stars, but a couple of the bulbs did not work when arrived and had to replace. otherwise, a great purchase! These lights are nice but after receiving them and shopping around for s few more I realized that they are overpriced. I love the look of these lights. There are 4 strands hanging on my front porch. Such a nice relaxing color when turned on. Brightened everything up for family get together. The only thing I don't like about them is that the plug gets really hot after they've been on for an hour or so. Hopefully we won't catch on fire!! Beautiful lights with enough length to cover a small deck. We loved these. If you’re buying them, though, do be mindful that you will need an extension chord to go with...unless your outlet is up high. I would have liked to give this product a 5-star review but as some people have already mentioned, the bulbs are terribly fragile. My lights came with 2 broken bulbs. These worked for an outdoor party; bit disappointed that not all bulbs of one string lit up. Cute lights! They provide plenty of light on our back deck. very good quality and long bulb life! i put 3 strands on my back deck & WOW! they definitely put out a nice bright light...i love them. i actually have several more strands in inventory to replace them with. I bought these lights for my back yard and they are so pretty. BUT the have not held up for the price. My husband has had to splice them together several times. The bulbs are impossible to find to replace because they are not a common size. And this week the plug in fell off. My husband is going to try to splice and replace it but is not confident he can make it work. A bit pricey but they look gorgeous on our lanai. They provide as much if not more light than our patio light. Bulbs are VERY delicate... broke two just by them bumping against each other while hanging.. otherwise, very, very pretty! What a romantic ambience these lights provide! Great lights for outside decor. Got them for a lot cheaper then I found out in town. "I'm having a hard time replacing the bulbs, which didn't last very long. I love the light but am wondering if anyone has found the perfect replacement bulbs?" "Where can I purchase replacement bulbs?" "If one bulb goes out, does string stay lit?" The rest will stay lit. Highlight the best parts of your yard with carefully placed landscape lights. When planning how to light your yard, consider which outdoor lighting ideas match your style and contribute most to the mood you want to set. You’ll be able to adapt the perfect outdoor lighting for elegant entertaining, backyard barbecues, and al fresco family dinners for years to come. These outdoor lighting ideas will help you strike an ideal balance between function and style. 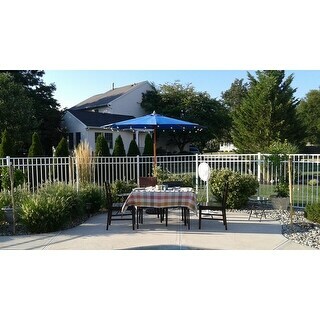 How to Use Solar Garden Lights from Overstock.com. Our guides provide customers with information about how to use solar garden lights.